George IV (George Augustus Frederick; 12 August 1762 – 26 June 1830) was King of the United Kingdom of Great Britain and Ireland and of Hanover following the death of his father, George III, on 29 January 1820, until his own death ten years later. From 1811 until his accession, he served as Prince Regent during his father's final mental illness. His charm and culture earned him the title "the first gentleman of England", but his poor relationship with both his father and his wife, Caroline of Brunswick, and his dissolute way of life, earned him the contempt of the people and dimmed the prestige of the monarchy. He even forbade Caroline to attend his coronation and asked the government to introduce the unpopular Pains and Penalties Bill in a desperate, unsuccessful attempt to divorce her. For most of George's regency and reign, Lord Liverpool controlled the government as Prime Minister, with little help from George. His ministers found his behaviour selfish, unreliable and irresponsible. At all times he was much under the influence of favourites. Taxpayers were angry at his wasteful spending at a time when Britons were fighting in the Napoleonic Wars. He did not provide national leadership in time of crisis, nor act as a role model for his people. Liverpool's government presided over Britain's ultimate victory, negotiated the peace settlement, and attempted to deal with the social and economic malaise that followed. After Liverpool's retirement, George was forced to accept Catholic emancipation despite opposing it. His only child, Princess Charlotte, died before him in 1817 and so he was succeeded by his younger brother, William. Nelson's Column is a monument in Trafalgar Square in central London built to commemorate Admiral Horatio Nelson, who died at the Battle of Trafalgar in 1805. The monument was constructed between 1840 and 1843 to a design by William Railton at a cost of £47,000. It is a column of the Corinthian order built from Dartmoor granite. The Craigleith sandstone statue of Nelson is by E.H. Baily, and the four bronze lions on the base, added in 1867, were designed by Sir Edwin Landseer. The pedestal is decorated with four bronze relief panels, each 18 feet (5.5 m) square, cast from captured French guns. They depict the Battle of Cape St Vincent, the Battle of the Nile, the Battle of Copenhagen, and the death of Nelson at Trafalgar. The sculptors were Musgrave Watson, William F. Woodington, John Ternouth, and John Edward Carew, respectively. It was refurbished in 2006 at a cost of £420,000, at which time it was surveyed and found to be 14 ft 6 in (4.4 m) shorter than previously supposed. 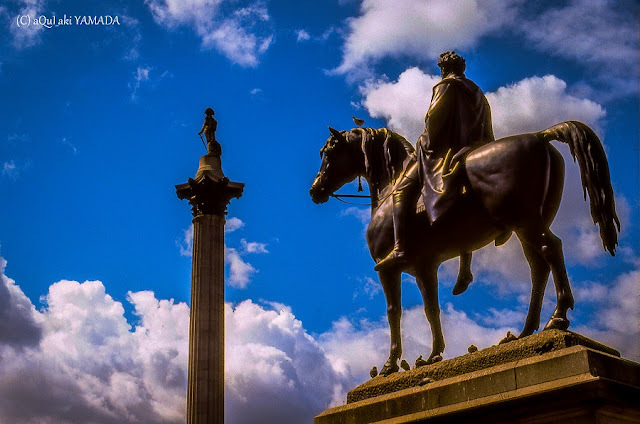 The whole monument is 169 ft 3 in (51.6 m) tall from the bottom of the pedestal to the top of Nelson's hat. 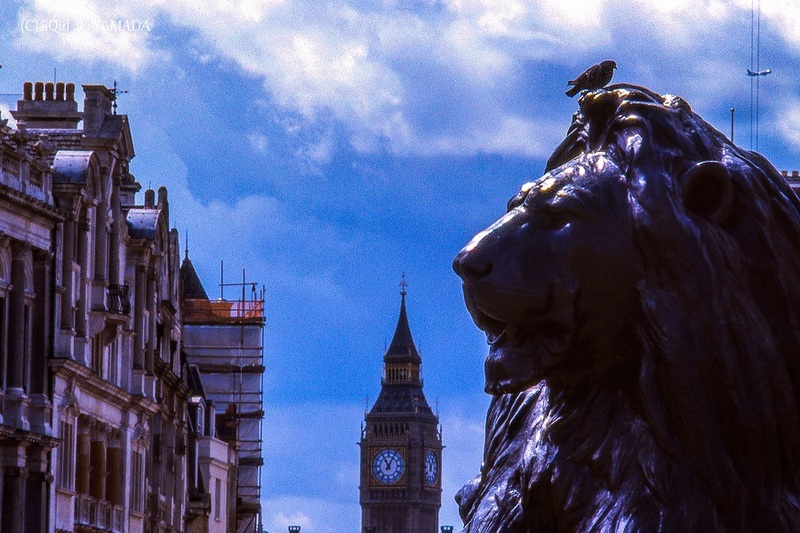 Madlib - Montara "Shades of Blue"
Trafalgar Square (/ˌtrəˈfælɡər/ trə-FAL-gər) is a public square in the City of Westminster, Central London, built around the area formerly known as Charing Cross. Its name commemorates the Battle of Trafalgar, a British naval victory in the Napoleonic Wars with France and Spain that took place on 21 October 1805 off the coast of Cape Trafalgar, Spain. The square has been used for community gatherings and political demonstrations, including Bloody Sunday, the first Aldermaston March, anti-war protests, and campaigns against climate change. A Christmas tree has been donated to the square by Norway since 1947 and is erected for twelve days before and after Christmas Day. The square is a centre of annual celebrations on New Year's Eve. It was well known for its feral pigeons until their removal in the early 21st century. 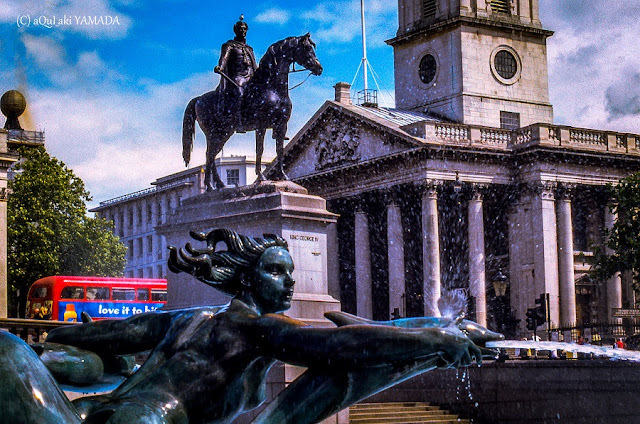 Trafalgar Square is owned by the Queen in Right of the Crown and managed by the Greater London Authority, while Westminster City Council owns the roads around the square, including the pedestrianised area of the North Terrace. The square contains a large central area with roadways on three sides and a terrace to the north, in front of the National Gallery. The roads around the square form part of the A4, a major road running west of the City of London. The square was formerly surrounded by a one-way traffic system, but works completed in 2003 reduced the width of the roads and closed the northern side to traffic. 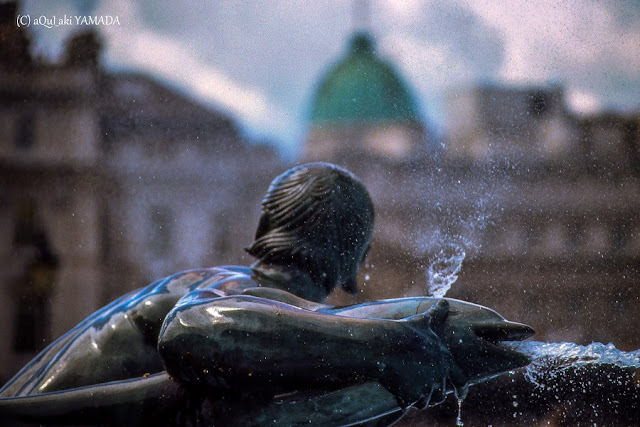 Nelson's Column is in the centre of the square flanked by fountains designed by Sir Edwin Lutyens between 1937 and 1939 as replacements for two fountains of Peterhead granite (now in Canada) and guarded by four monumental bronze lions sculpted by Sir Edwin Landseer. 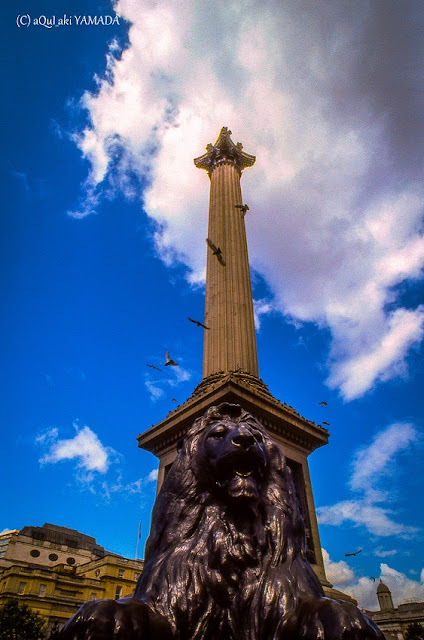 At the top of the column is a statue of Horatio Nelson who commanded the British Navy at the Battle of Trafalgar. 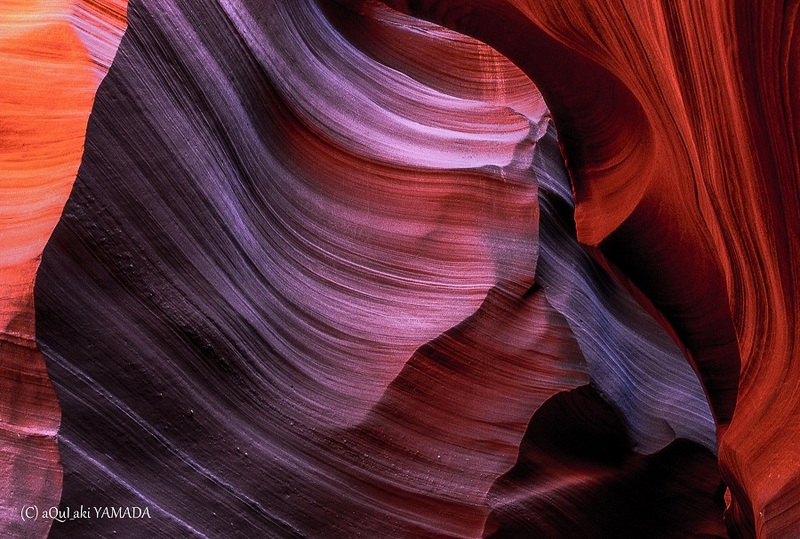 ft. Ledisi, John Scofield "Everything's Beautiful"
The Navajo name for Upper Antelope Canyon is Tsé bighánílíní, which means "the place where water runs through rocks". Lower Antelope Canyon is Hazdistazí (advertised as "Hasdestwazi" by the Navajo Parks and Recreation Department), or "spiral rock arches". Both are located within the LeChee Chapter of the Navajo Nation.